A particular chromosome set may be characterized by the determination of number of chromosomes, their relative size, position of centromere and position of secondary constriction and satellites. 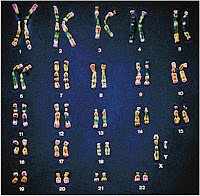 This whole group of characteristics is called Karyotype. The karyotype of different species are compared and similariltes in karyotypes are presumed to represent evolutionary relationship. The karyotype is usually represented by a diagram (Idiogram) in which the pairs of homologues are arranged in a series of decreasing size.